Infections and superbugs will continue to hit NHS hospitals unless hand-washing facilities are modernised, experts have warned. It follows a study at an unnamed trust which found that sinks and taps did not come up to scratch. The hospital had few elbow operated taps or foot-operated bins - both recommended as a way of reducing hospital acquired infections. A report by the National Audit Office, published last year, suggested that as many as 5,000 patients a year could be dying from infections caught in hospital. It estimated that a total of 100,000 may catch bugs in hospital each year, costing the NHS in the region of �1bn annually. Joan Cochrane, a senior lecturer in infection control at Northumbria University, examined hygiene facilities at the trust between April 2000 and March 2001. She found that the types of taps varied from sink to sink, according to a report in Nursing Standard magazine. Few areas had mixer or elbow-operated taps. There were also few signs advising staff to wash their hands. In addition, foot-operated bins were either missing or were broken in more than half of the areas. She said the study findings were probably a good example of the situation in the NHS at the time. Speaking to BBC News Online, she added: "I think improvements are continuing to be made part in hand hygiene policies and products available across the NHS but we need to continually flag up the fact that no matter how busy people are they should still be handwashing and should not be cutting corners." Professor Robert Pratt, president of the Infection Control Nurses Association, said poor facilities were contributing to the spread of infections. "All NHS trusts are supposed to ensure staff follow the guidelines. Doctors and nurses are expected to wash their hands before each intervention and after each intervention. "Clearly there is a problem with nurses and doctors not being able to do this if they don't have the proper facilities." Speaking to BBC News Online, he added: "One of the principle factors in transmitting infections in hospitals is related to hospital staff not cleaning their hands properly. "It is a problem across the NHS and in all western healthcare systems." 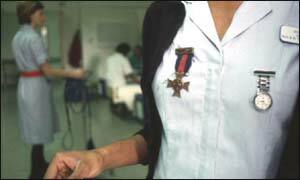 Shadow Health Secretary Dr Liam Fox called for urgent action to tackle hospital infections. "These recent warnings are the latest indication of how severe the problem of superbugs have become throughout British hospitals. "Patients should go into hospital to recover by receiving the health care they need. They should not be at risk of becoming sicker during their stay than when they arrived, by being exposed to a hospital acquired infection." Paul Burstow Liberal Democrat health spokesman added: "These findings are very worrying but not surprising. "Ministers have failed to realise that according to health professionals MRSA is now one of the biggest killers in the NHS."